As a child, I never quite fit in. Reading opened up the world for me and books became my most treasured sanctuary. Writing was a natural progression and became a passion. I dabbled in short stories and poems. Then, during my high school years, I signed up for the odd writing contest. In 1988, I won first price in a state-wide competition. I conducted a survey in my town and wrote a hundred-page study on how our school system could be re-vamped. 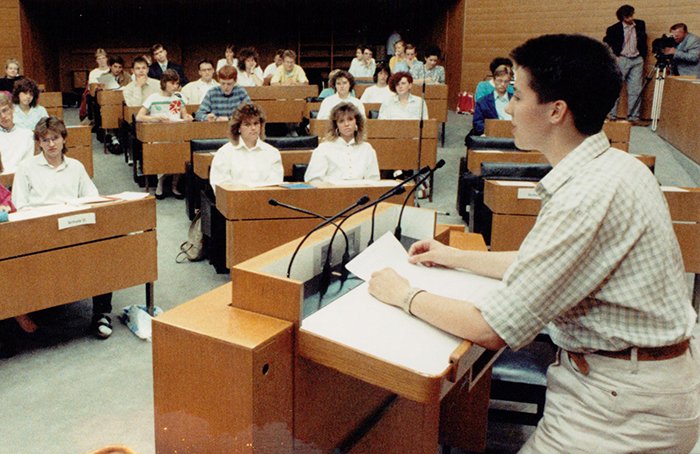 As a result, I was invited to the parliament of Baden-Wuerttemberg along with about two dozen other teenagers and was asked to share my findings and give a speech to my fellow students. Stepping up like this in front of people was a pivotal moment in my young life, even though most of my adolescent contemporaries would rather have been someplace else judging by their slightly bored facial expressions. I wasn’t fazed and wasn’t by far as nervous as I had expected to be. Towards the end of my speech, part of my audience even looked a bit more awake. Now, 27 years later, I find myself smiling at this memory and at my unshakeable optimism and curiosity that have stayed with me my entire life. This entry was posted in Book, Inspiration, Memoirs, Paralian, Writing and tagged #book, #inspiration, #memoirs, #paralian, #writing on September 20, 2015 by liamklenk.